This two piece Mickey Mouse pyjama set is 100% cotton. 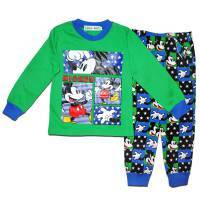 These Mickey Mouse pyjamas have a long sleeved top with an Mickey Mouse print, round neckline and come with matching green, blue and black long pants. Great pyjamas for Mickey Mouse fans.